MS Walk, Saturday April 19th starting at 9 AM at West De Pere High School. About 4 radio operators needed. Contact Bob, KB8ZXE. April 19th Oshkosh Marathon - Interested operators should sign up online at http://ecwec.org/register/ and click on the Oshkosh Marathon 2015 link. The Brat Barn dates are May 3rd, and June 14th at Festival Foods in De Pere. Contact, Keith KS9WI if you can help. There will be a VE Testing at SNC on Thursday 5/14.... 5PM.... before the May meeting. 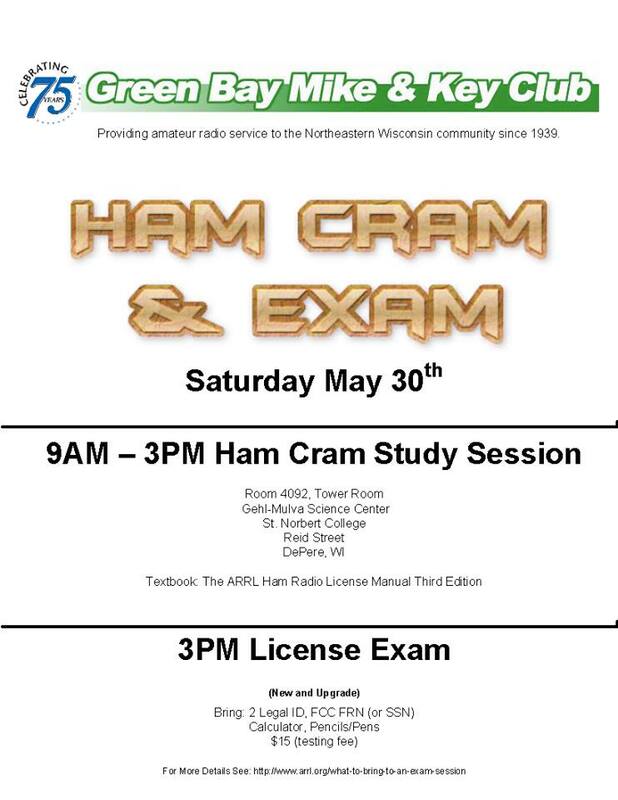 Also a Ham Cram, study and VE testing session to be held May 30th and St. Norberts (link to needed study guide) Testing to follow about 3PM. Demonstration for the Boy Scout leaders at the National Railroad Museum is on May 14th 6 to 9, contact Shane, KA8QZH is you can help. Field Day (June 27-28) will again be held on the Elks Lodge property at 3195 S Ridge Rd. A discussion about a special event station to commemorate our 75th year to be possibly held in May ensued. The Brown County ARES net will resume starting in May. It is held Sunday nights at 8pm, on 147.120. 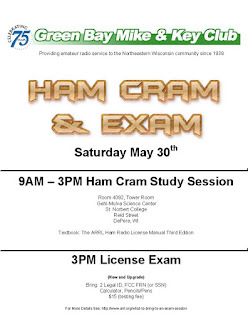 And of course the Green Bay Area 2-Meter net is held each Tuesday night, starting at 8:45pm, also on 147.120.